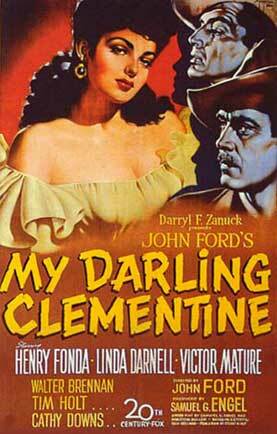 Brokeback Mountain might be responsible for a resurgence of interest in cowboy style but for some good old fashioned, way out western looks check out John Ford’s My Darling Clementine. Spurs, chaps, ten gallon hats – they’re all on parade here along with some dandy boots and waistcoats. Based on a story derived from a book that harkens back to historical fact, the screenplay finds cattle herder Wyatt Earp (Henry Fonda) assuming the job of Marshall in the ominously named town of tombstone after the murder of his 18 year old brother. Sporting a hat that could, at certain angles, be described as ‘dorkish’, Earp nevertheless commands respect from the unruly townsfolk as he patiently waits for his brothers’ killer to show his hand. While biding his time, he befriends the feared outlaw Doc Holliday (Victor Mature) whose health has deteriorated so much from consumption that not even the sassy showgirl Chihuaha (Linda Darnell) can cheer him up. And things get more complicated when Doc’s sweetheart from Boston blows into town. Shunned by the man she’s tracked down from cattle camp to cattle camp, Clementine (Cathy Downs) finds solace (and a natty dancing partner to boot) in Earp. But all this romance is inevitably overshadowed by the climactic shoot out at the O.K. Corral. This is Ford at his finest. With the spectacular Monument Valley as his backdrop, he spins his patriotic story about good guys making the wild west a safer place to live in with pathos and humour. Whenever the tension gets too high in the town saloon, musicians leap into action and belt out a number to dispel the anxiety. And to prove that the locals aren’t all heathens, we’re given a rendition of Hamlet’s speech for extra cultural resonance. There is a heart-stopping shot tracking beside stage coaches drawn by six horses at a gallop and a kooky knees up at the dedication of the new town church. And, if you look closely, you can even see a white handkerchief hanging out of the left hand pocket of Earp’s jeans. Maybe it’s a sign? Maybe he, like the Brokeback boys, was in fact, gay?